Brick Town Talk: A Fistful of Details - LEGO Town, Architecture, Building Tips, Inspiration Ideas, and more! The American West - (BTT) The person who first coined the phrase "This town ain't big enough for the two of us" clearly wasn't residing here at the time - this town is huge! 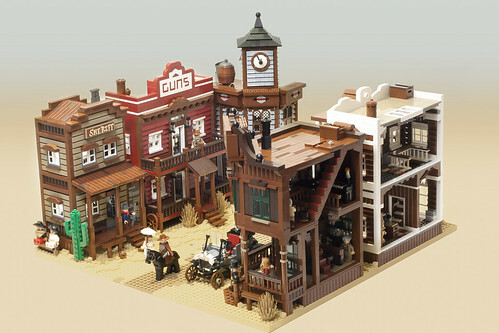 Five distinct buildings make up this street, with a general store and saloon on one side and the sheriff and gun store on the other, each with their own exterior character and interior details.